The clock is winding down in the race to win two tickets to see Shinyribs at Dan’s Silverleaf Saturday night in Denton, Texas. The rules, as stated, are 1) be the thirteenth comment either on a post or in the boards OR 2) be the last comment before midnight tonight AND you will have two tickets to see some down home, foot stomping, mandolin playing, Texas twanging music. 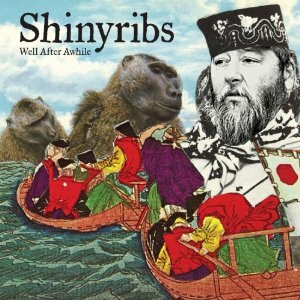 If you are unfamiliar with The Gourds, then chances are you haven’t heard of Shinyribs either. Shinyribs is a project of Gourds co-frontman and guitar, ukulele, and mandolin player Kevin Russell. His release, “Well After Awhile,” is refreshing to say the least, and once I get my hands on it tomorrow night, I will put it in and give it a spin. The song “Who Built the Moon” is enough to warrant digging down into my jeans and pulling out a crumpled, and tightly held 20. Free listens are easy to access at his myspace site – http://www.myspace.com/shinyribs, and http://www.reverbnation.com/shinyribs . There is no presale, or online sales of tickets, so I will be picking up tickets at the door when doors open at 6. The winner will be notified, and given a supersecret code to give to the door and get their two tickets. I’ll be there too … sometime, blending in and looking to see who gets those magic tickets. Looks like I am getting off easy! All I have to do is just … keep … talking.